Samsung may have let the cat out of the bag by showing it off at IFA, but the Samsung Galaxy i5510 is officially coming to Europe. TechRadar first broke news of the forthcoming budget slider back in September, when a cheaper QWERTY phone with the stylings of the Galaxy Apollo was confirmed. 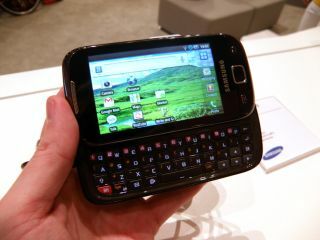 We then brought you our hands on Samsung Galaxy i5510 review from IFA itself, and now the full specs have been confirmed as well. A 667MHz processor, 3MP camera, 3.2-inch WQVGA display and the same TouchWiz 3.0 UI as on the Samsung Galaxy S all are present and correct, as is the price tag of €389 (£340). Other little surprises include DLNA and a 1200mAh battery, which may struggle a little bit if the phone is a bit power-heavy, although Android 2.2 will certainly help things along. It's been given a European (and presumably UK) release date of November, so we'll let you know all about the handset in our full Samsung Galaxy i5510 review.